This case demonstrated presenting symptoms of haemolytic anaemia. This was indicated by a low HB, raised LDH, raised reticulocytes, elevated bilirubin, and low haptoglobin levels. A negative DAT suggests that this is not an autoimmune cause, however in practice the DAT test should be repeated to confirm the negative result. 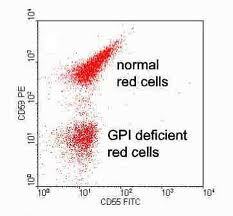 The low ferritin level, DAT negative haemolysis and evidence of pancytopenia are all indicators towards a potential diagnosis of PNH. However PNH is extremely rare and therefore alternative diagnoses should not be forgotten!! Haemolysis is premature destruction of erythrocytes. 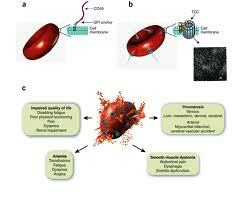 The severity of the haemolysis depends on the speed on onset and the extent of erythrocyte destruction. Mild haemolysis can be asymptomatic, however severe haemolysis can be life threatening. Hemolysis may be an extravascular or an intravascular phenomenon. Intravascular hemolysis – prosthetic cardiac valves, G-6-PD deficiency, thrombotic thrombocytopenic purpura, disseminated intravascular coagulation, following transfusion of ABO incompatible blood, and paroxysmal nocturnal hemoglobinuria (PNH). (3) a deficiency in hematopoiesis that may be mild or severe, such as pancytopenia in an aplastic anaemia state. The triad of haemolytic anaemia, pancytopenia, and thrombosis makes paroxysmal nocturnal haemoglobinuria (PNH) a truly unique clinical syndrome. The term “nocturnal” refers to the belief that haemolysis is triggered by acidosis during sleep and activates complement to haemolyse an unprotected and abnormal RBC membrane. However, this observation was later disproved. Haemolysis has been shown to occur throughout the day and is not actually paroxysmal, but the urine concentrated overnight produces the dramatic change in colour. These proteins interact with complement proteins, particularly C3b and C4b, dissociate the convertase complexes of the classic and alternative pathways, and halt the amplification of the activation process. Haemolytic anaemia is due to intravascular destruction of RBCs by complement. Breakdown of RBC membranes by complement leads to the release of haemoglobin into the circulation. Haemoglobin is bound to haptoglobin for efficient clearance from the circulation. Depletion of NO levels leads to smooth muscle contraction with consequent vasoconstriction, constriction of the gut, and pulmonary hypertension. Symptoms of abdominal pain, bloating, back pain, headaches, oesophageal spasms, erectile dysfunction, and fatigue are due to NO depletion by scavenging free haemoglobin. This diagram helps explain the pathophysiology a little clearer!!! Lack of GPI anchored proteins allows the formation of terminal complement complex (TCC), which renders the cell susceptible to intravascular haemolysis! decreased renal perfusion from renal vein thrombosis, and tubular obstruction with pigment casts. high incidence (40%) of thrombotic events (mostly venous) in large vessels (cerebral, hepatic, portal, mesenteric, splenic, and renal veins) and, most recently recognized, arterial thrombosis. either severe aplastic anaemia or severe recurrent thrombotic events. New anticomplement agent – monoclonal antibody against terminal protein C5. Shown to be highly effective in reducing intravascular haemolysis. Patients require vaccination against meningococcus. This entry was posted in Anaemia and tagged Aplastic anaemia, CD55, CD59, Flow cytometry, GPI anchored proteins, haemolysis, haemolytic anaemia, PNH. Bookmark the permalink.